Flower..T94..9-10mm Flower..U39..8-10mm NEW! Flower..46..9-10mm NEW! Flower..U14..8-10mm..Back in stock! Flower..S63..8-10mm..NEW! Flower..119..8-10mm..NEW! White/turquoise. Rough cuts, different thicknesses. Dark blue/white/red/yellow. Pieces might be a little dusty in bag. Flower..V05..8-10mm NEW! 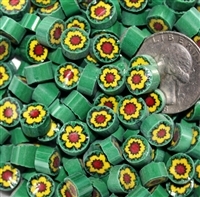 Flower..T02..8-10mm - Back in Stock! Flower..T21..8-10mm NEW! White/transparent/white center. T01 has a transparent center. Flower..U38..8-10mm Flower..64..8-10mm..New Size! Flower..S30..8-10mm NEW! Also available in size 10-11mm. Cherry red-clear. Might be a little dusty in the bag but rinse them and they shine. We waiting a long time to get this pattern back in stock. It was worth it! 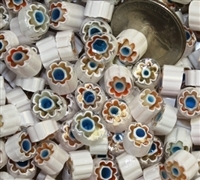 Flower..U67..8-10mm Flower..U56..8-10mm Flower..T49..8-10mm - Back in Stock! Also available in size 7-8mm. Flower..T41..8-10mm - New Size! Flower..T99..8-10mm..New! Flower..135..8-10mm..New! Lime/white. This pattern is different from T36 which has a white center dot. Also available in sizes 3-4mm, 5-6mm, and 7-8mm. Light blue/dark blue/white. 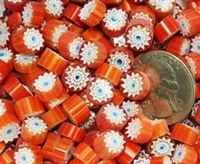 Also available in sizes 4-5mm, 5-6mm, and 6-7mm. Aqua/white. Available in other sizes, too. Flower..T75..9-10mm..New! 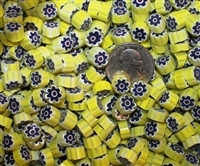 Flower..T08..8-10mm Flower..99..8-9mm - Back in Stock! Almost out ~ Light blue/white/yellow/small blue dot center. Flower..U18..8-9mm..New! 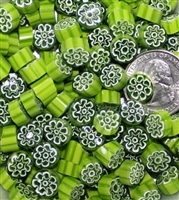 Flower..T33..8-10mm - Back in Stock! Flower..V76..9-10mm New! 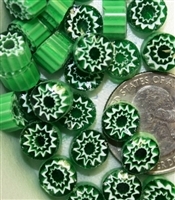 Flower..U04..9-10mm Flower..T80..8-10mm Flower..U15..8-10mm..Back in stock!